Hey all! Happy End of May to all of you. I'm pretty sad to see May go, frankly, it's one of my favorite months of the entire year, certainly my favorite month of the spring/summertime. So I'm mourning it's end a bit, but I am indeed excited by what is to come this summer! A few blog housekeeping things, and then I thought we could have some crafty time together. 🤗I posted last week about the Tea Time podcast, looking for ideas on where to take that project this summer. I heard from a few of you, and so far I'm still very undecided on themes for the summer! These would be super short episodes, less than 10 minutes. I was thinking that I would start up next week, but I just don't have my act together yet, :0 so I'll keep you posted! I want it to feel inspired, like all of the pieces fall into place. Otherwise, maybe the timing isn't quite right, you know? So we'll see. I shall keep you apprised! (2) Read it in a more condensed time frame, say 2-3 weeks in mid-July after the holiday, discussing 5 or more short chapters at a time? Vote in the comments, please! In other news, springtime crafting has hit me with an inspired vengeance. I do tend to do this as June approaches, and ultimately I go into full fledged Christmas in July mode. I plan out all my holiday gifts and other fall/winter accessories I'd like to make, and then go hog wild with the summer yarn sale at Knit Picks. Granted, I'm on a yarn fast this year. Yes, this is actually a thing. I have a LOT OF YARN. A LOT. So I'm trying to use what I have. *halo* We'll see, because occasionally a pattern will call for something that I do not already have in my yarn stash, because *sometimes miracles really do happen*, and then I am completely justified in ordering what I need. Or so I tell myself. Pattern is Itty Bitty Bear Cubs, and is available for free! Pattern is Little Shoreline Vest, from "Swoon Maine"
Right now, it looks like a ribbed amoeba, I know, but eventually it will look like a baby vest. ;-) The pattern called for a technique that was new to me, called Sunday Short Rows, and I really enjoyed learning a new skill! For my nephew, who lives in Maine, I will make a full fledged wool cardigan. He will need it, hee! I think I'm going to go with the Little Shore Cardigan, also from "Swoon Maine." If you couldn't already tell, I absolutely love that book! I also have my eye on the Little Lighthouse Pullover for Anne. I now have a full queue over at Ravelry of sweaters, wraps, accessories and socks. Check out the featured patterns in "New Directions in Sock Knitting" which a friend gave me for Christmas. Those crazy zig zag ones in the upper left corner? I MUST MAKE THEM!! I just ordered a new yarn winder, and I'm all set to go for my summer project goals! Are you crafting anything this summer? What is your vote for the Summer Book Club - all of July or a shorter 2-3 week span? I'd love to hear from you in the comments! That bear hat is adorable. I think my nephew might need one. Which size did you knit? I see a small preemie and a large preemie available. I've had those zigzag socks in my favorites for awhile. I think they look awesome and I think I should knit them some day. I want to knit this Mary Poppins inspired shawl this summer. https://www.ravelry.com/patterns/library/strike-me-pink I found yarn in my stash that will work, two different shades of blue, and wound it but that is as far as I have gotten. I saw you posted a project in Orientation at Hogwarts at Ravelry. I'm over there too (as Koala750). 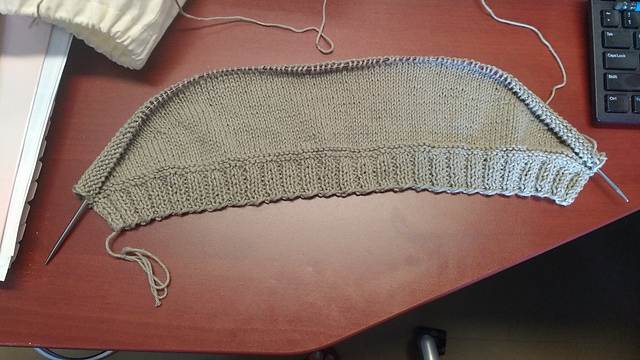 Casting on for the shawl will have to wait as I'm trying to finish up a few other projects before the rotation ends. I was originally going to vote for the whole July option for the book club and then I realized I will be out of town for part of that first week so starting later would work better for me. Hi Melanie! 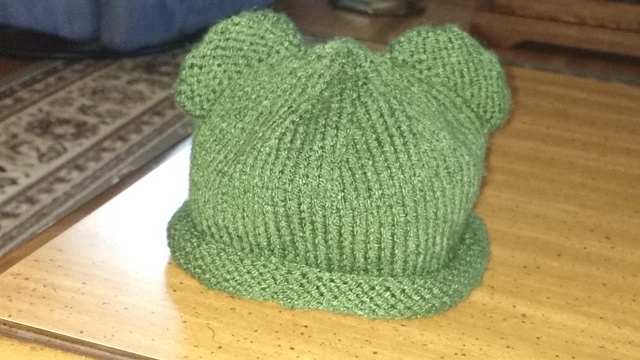 The pattern is actually written for preemie hats, so what I did was use worsted weight yarn and a size 5 needle (rather than size 4) to make it bigger. I believe the socks are seamed, which displeases me, but makes total sense. I really need to challenge myself to knit them! ooo, a shawl, a perfect summer project! For the book club, I think we should definitely start after the week of the 4th, regardless. Thanks for the knitting tips. I have worsted in stash so that is an easy switch. I'm in Hufflepuff. Come visit us. We have cookies. Just watch for the sorting hat to show up (link to sorting form) in mid June. There should be announcements posted all over the castle and platform 9 3/4. I AM SO EXCITED!!! Do you have any impressions of the personalities amongst the different houses? I'd love to hear them. :) I will definitely visit Hufflepuff! I think doing a 2-3 week conversation would be great so we complete before the school time frame starts to kick in with all the prior to school events. But I am excited about this book and have already ordered it! Hi Linda! So glad you'll be joining us! You know this is a good point. Where I'm from, school goes til late June, and doesn't start again until September. So I tend to forget that a lot of people start school back up in August. I'm leaning toward the shorter route too, I think the book lends itself to it well! I actually tried to learn how to knit, but that didn't go terribly well. I guess I need to find someone to knit hats for me, haha. On an unrelated note, I was asked to be the godfather at an upcoming Baptism. It's quite an honor and I'm really looking forward to it, but I'm kinda stumped on what I should buy for his gift. If you -- or any other commenter -- has any ideas, I'm all ears. P.S. I'm good either way for the book club. Whatever works best for everyone else is fine by me. Hey Kevin! *waves enthusiastically* How long ago was your knitting attempt? If it's been several years, it might be worth another go. I had tried to learn to knit once before it actually "took" as well. After a little time to marinate, sometimes it goes better! And YouTube, it's our friend now. You can find the technique that you are struggling with and watch as many times as needed as you knit along. It's a lifesaver! I'll collecting votes for the book club and will post about it shortly! That's a great idea. Honestly, it was a pretty short attempt b/c I didn't really know where to start. Do you have a favorite YouTube knitter that I should check out? I don't have a favorite, actually. I just pop terms into the search bar and eyeball the top 5 hits. :0 I learned to knit by taking an in-person class at my local JoAnn's. That's an option for you if you have one near you! They have have a beginning knitting class in their schedule.